The critically-acclaimed HERO System rules are now available in a condensed form: the Basic Rulebook! 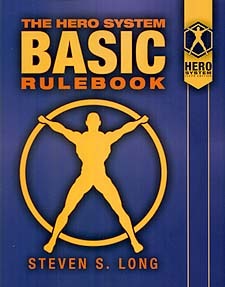 The Basic Rulebook contains all of the core HERO System rules, including character creation, combat and adventuring, and equipment - but without all of the options and details found in the standard rulebook. The Basic Rulebook boils the HERO System down to its essential elements so you can easily teach yourself the game, bring new players into your campaign quickly, or refresh your memory on a crucial rule. And when you're ready to move up to the complete HERO System, learning it will be a snap because the Basic Rulebook's already taught you the basics! But the Basic Rulebook doesn't sacrifice the flexibility, customizability, and freedom that are the hallmarks of the HERO System. With it you can create any sort of character, ability, weapon, spell, gadget, or vehicle you can think of. It lets you do just what you want to do: create great characters and games. A quick introduction to the HERO System rules, with guidelines and suggestions for character creation. Character creation rules, including Characteristics, Skills, Perks, Talents, Powers, Advantages, Limitations, Complications, and more. Combat, adventuring, and task resolution rules that are easily learned but offer a wide range of tactics and abilities. Five sample characters, plus hundreds of example abilities, spells weapons, and vehicles. A comprehensive glossary and index so you can easily find just the rule you're looking for.